Ganesh Himal Trekking has not the long history of its opening, though it is getting popular and its different kind of taste of trekking is pulling the people in a quite numbers. The trail starts from Trishuli following the upper valley landscapes witnessing the panoramic views of many majestic mountains, not tiring to see the smiling faces of local people from the villages and sometimes walking by the bank of rivers. The flat roofed fortress-like village in this remote village is its another charm to visit. The trek is tough but legendry mountains will erase all your tiredness and would be rewarding and enjoyable at the end of the day. Service includes: airport transfer in a private car, 4 nights in Kathmandu hotel (tourist class) in BB basis, 15 days trek in camping basis, 3 meal during the trek, two men tent, dining tent, toilet tent, table, chair, all kitchen necessary utensils, national park fees, Private bus Ktm-Trisuli/ Syabrubensi-ktm, one guide, one cook, porters, daily wages and meal and accommodation of guide and porter, one porter is allowed to carry maximum of 30 kg of total weight, insurance of guide & porter, full day sightseeing with English speaking guide with all entrance fees, one farewell dinner. Day 03	Kathmandu to Trisuli Bazar (600 m.): In the morning transfer to Trisuli bazaar with all the trekking equipment and the trekking staffs. We camp beyond the village, at noon we make a short walk around Trisuli Bazar. Bus drive is about 4.30 hours and the walk around Trishuli bazaar would be of 2 hours. Day 04Trisuli bazaar (600m) - Deurali (1600m): The walk begins by passing through free area and to rice field. We soon come at a bunch edge where a firm slope of about 1000 meters starts. We can see the local people walking on this trail as this is mainly used by the local people. We have lunch in the village Harkapur, small village. After lunch we continue walking and the last part of the walk is easily leads concerning flat unpaved. We camp on the school’s square area in Deurali. Today’s walk would be 5 to 6 hours, an ascent of 1000 meters. Overnight at Deurali. Day 07	Singang (1250m) – beyond Borang Kohla (1500m): We start our walk with a descent in a superb gap where we have good chance to see the monkeys in the trees. We keep on walking and the spectacular views of Ganesh Himal get on the way. During our walk, we frequently see the impact of deforestation in the form of landslides which we pass and finally reach to the bank of Lisne Khola in a millet field, this will be our camp for the night. We walk about 5 to 6 hours, an ascent of 700 m. and descent of 500 m. Overnight below Borang Khola. Day 08	Borang (1500m) - Chalise Khola (1400m): We cross the large part of landslide area and continue by the rice fields. We reach Borang Village, a colorful Buddhist portrait can be seen at the beginning of the village. After the lunch at Borang, we continue our trail firmly and get beautiful views of Ankhu Khola and the Ganesh Himal ahead of us. This area has been strongly cultivated and we can see the children everywhere greeting with smile and their enthusiastic "Namaste!". We descend now slowly in the direction of the Ankhu Khola and camp in the valley to the river of Chalise Khola. From here we can see 3800 meters tall Pangsang in East side which we will reach in 6 days later. We walk today 6 to 7 hours, an ascent of 400 meters and descent of about 450 meters. Overnight at Chalise Khola. Day 09 Chalise Khola (1400m)-Above Hindung (2400m): We start from Chalise Khola (1400m) with a short, rather steep cliff from the valley of the Chalise Khola and continue our route along the Ankhu Khola River, which flows deeply under us. We pass a number of large landslides and see the Ganesh Himal, which always seems approaching towards us, the view is magnificent and impressive. We pass different Buddhist chortens and already can see the village Hindung lying, in the middle of between the uncountable terraces. After lunch at Hindung we still walk a long piece of trail steep increases to the camp site which is situated on pasture (Kharka). We walk today 5 to 6 hours, an ascent of 1050 meters and descent of 50 meters. Day 10	Explore Hindung: Today we explore Hindung by going up to steep mountain trail to the peak of a hillock, from where the magnificent views of mountains like Ganesh IV (Pabil, 7052m) and the Ganesh II (7150m) and VII (6350m), can be seen. Also, are chances of seeing Langur (monkey) from the big long standing trees. And we retreat back to Hindung again and sleep there for the night. We may have walked about 4 to 5 hours today and an ascent of 550 m. and descent of 550 m.
Day 11	Hindung (2400) - Chalise Khola (the 1400m): We retreat back again to Chalise Khola that we have passed couple of days ago. We reach the camp site in noon by walking about hardly 3 to 4 hours. Our ascent of today would be 50 meters and descent of 1050 m. It is all the way coming down to Chalise Khola and camp for the night. Day 12	Chalise Khola (2400) - Labdung (2300m): The trail starts going towards an old commercial trail in the direction of the Pangsang danda (3800 m), where our destination is yet to come. The trail and landscape becomes widened grand. We also cross the suspension bridge of the river along with enjoying the marvelous views on the trail, after Adha Khola by crossing suspension bridge we immediately climb to in the village Tipling. Beyond Tipling we find mani wall, the stone made mani wall built by the villagers with mantras, often heard chanting “Om mani padme hum"., Tibetan culture is witnessed in this region. Our camp will be here for the night. Our walk of the day would be 5 to 6 hours, by climbing up about 950 meters and going down of 50 meters. Day 13	Labdung (2300m) – Marmelung Kharka (3300 m) Today we will be gaining the height. The landscape is simply eye catching with crossing the forests of rhododendron and watching our national bird “Danphe”. We still keep on continuing until we come to a big pasture (kharka), called as Mergang Kharka, where the cattle come to graze. We stop here for the lunch . Our walk will be immediately steep up after lunch, but, outstanding views of Ganesh, Manaslu and Annapurna mountain erases our fatigue. After 45 minutes of again steep walk and gentle level path we walk through the jungle of rhododendron and we camp in the middle of the forest where small kharka is there. Our camp site will be here at Marmelung Kharka. 4 to 5 hours walk today. Day 14	Marmelung Kharka- Pangsang (3850m) - Somdang (3220m): Today we cross Pangsang La Pass (3850 m), it takes about 2 hours of steep walk, it is tough one, the place is considered as the phenomenal physical return investment due to outstanding and rewarding views of majestic mountains like Ganesh, Manaslu and of Annapurna. We descend down our trail for today is several ups & down crossing again through the rhododendron forest. The path continues with tress, shrubs and by the open field. 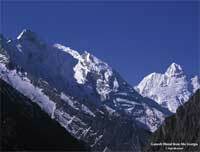 Along the trail we will be witnessing the spectacular view of massive Langtang which view is amazing. Here the lifestyle is influenced by the Tibetan culture. After a short descent we reach the lunch spot, where the various kinds of large birds can be seen. After lunch we keep on walking our trail towards Somdang and after sometime we reach the camp site of Somdang.. Today we walk for 7 hours with about 700 meters ups and down, more or less. We camp at Somadang for the night. Day 15	Explore Somdang: We take as a rest day today or those who are interested to walk around can go to place from where East side of Ganesh is easily seen. You can also walk up to the height of 4000 meters to have the beautiful views of Paldor Himal (5928 meters) from Lari mine (4110 m). This alpine place is full of vegetation. Our day hike would be about 6 to 7 hours with several ups & down. Day 17	Gatlang (2770 m) – Syabrubensi (1600 m): Our last day of the trek, we come to a Gompa (small monastery) where we can visit inside and learn the art & the culture of Buddhism, we again walk the trail which is known as the pilgrimage trail uses by the pilgrims. This beautiful trail leads along a lot of mani walls and small chorten which has been built by the pilgrims themselves. The colorful village is an enjoying sight of spot to cross. 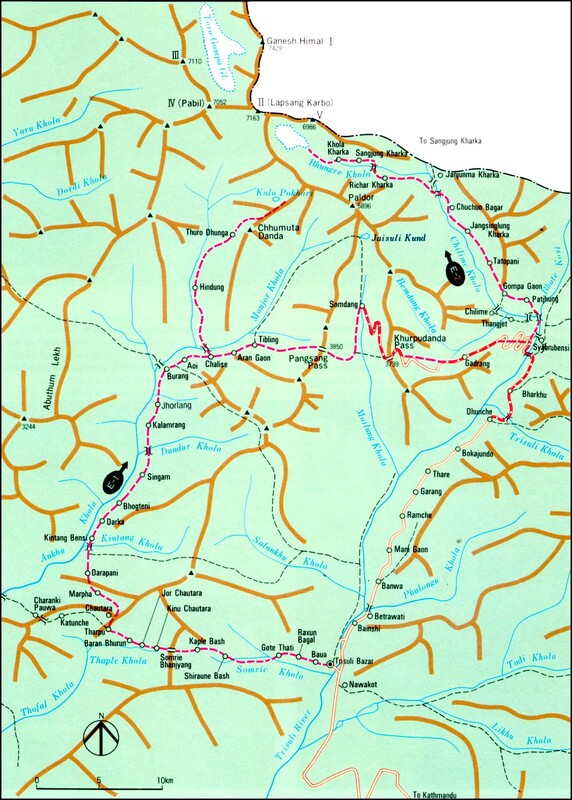 We keep on walking and now have the steep descent, we come at the river which we follow till Syabru Bensi. Today we walk about 7 hours, climbing up about 100 meters and getting down about 1300 meters We stop at Syabru Bensi where few lodges are available but we camp at a nice place at Syabrubensi for the night. Day 19	Morning and after noon is free for shopping, in the evening farewell dinner is arranged. Day 20	Transfer to airport for final departure.